Limerick, SK grain elevator, Sept. 2002. Contributed by Pat Scrimgeour. 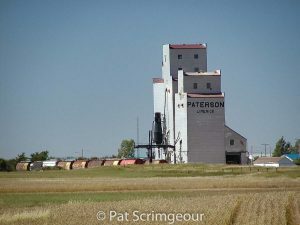 Pat Scrimgeour has contributed numerous grain elevator photographs to this site. His photos date from 2002 through 2006 and provide valuable information on elevators that have changed owners, or no longer exist. You can find him on Instagram as @scribblebunnies, Flickr and RailPictures.Net.